Garden City, N.Y. — On Thursday, January 15th, the Cradle of Aviation Museum hosted NASA Astronaut Stephanie Wilson to help students prepare and later celebrate Black History Month. Students heard about her experience as both an Aerospace Engineer and about her time in space during three Space Shuttle Missions! Students from Hempstead, Freeport, Roosevelt, and Westbury had the opportunity to speak with Astronaut Wilson learning about how astronauts live and work in space. 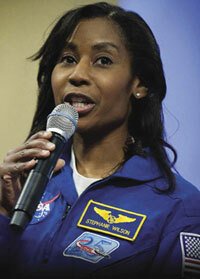 “Astronaut Stephanie Wilson really got the students excited about S.T.E.M. (Science, Technology, Engineering, and Mathematics) through her experience working for NASA. Viewing the International Space Station as it travels around the Earth, seeing the crew on their space-walks, and watching them work on experiments enhanced the students understanding of NASA. Some students were even eager to get onboard and into space themselves!” said Catherine Bingham, Education Manager. The impact of NASA’s missions for students is limitless. As NASA launches new projects into space, it’s important for students to realize their potential; they can be the next generation of scientists, engineers, and astronauts too! Selected as an astronaut in 1996, Stephanie Wilson was in mission control as a communicator with the Space Shuttle and later became a crew member on STS-121, STS-120, and STS-131. Specializing in robotics operations on both the Space Shuttle’s Canadarm and the larger Canadarm2 aboard the International Space Station (ISS), she was responsible for several module installations during assembly of ISS and provided support for spacewalks. In addition she helped transfer critical supplies from the shuttle to ISS during docked operations.